Social media constitute an important medium for disseminating information. 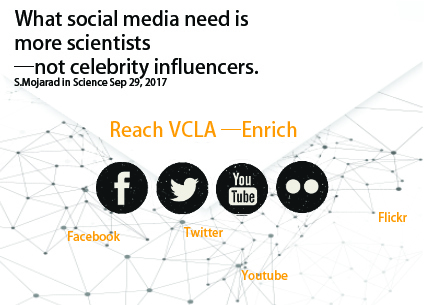 To achieve the spill over effect of the knowledge accumulated within the constituting research groups of VCLA and to connect their members with the network of stakeholders and the general public, VCLA is expanding the channels within the digital community. Every coin has two sides, and social media is no exception. It can run the risk of being a source of misinformation, but it can also be an effective way to redirect that information. Among other, scientist use social media to their advantage to gain more media attention, potential collaborators, job opportunities and funding opportunities (AAAS 2017, FWF 2017). The crux of the mater of open science initiatives, taken over also by the funding bodies of VCLA seems to be: In order for members of the civil society to participate meaningfully in dialogue on science and socioeconomic development they need to be informed. The major sources of knowledge available to them are not the peer-reviewed journals and conference proceedings that are the kit and caboodle of academia (SIRC 2006, ERC 2017). American Association for Advancement of Science (AAAS). 2017. Communicating Science Online. European Research Council (ERC). 2017. Communication your research. FWF. 2017. Open Access Policy für vom FWF geförderte Projekte. Mojarad, Sarah. 2017. Social media: More scientists needed. In Science 357(6358), 1362-1363. RRI Tools. 2017. The EU guide to Science Communication. Social Issues Research Center (SIRC). 2006. Guidelines for scientists on communicating with the media.